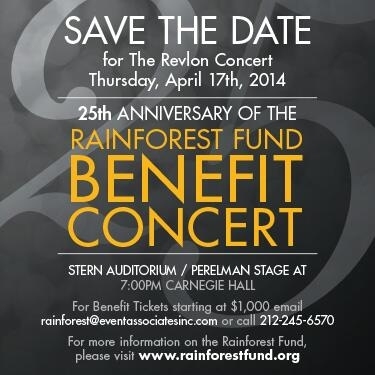 In celebration of the 25th anniversary of the Rainforest Fund, co-founders Sting and Trudie Styler are pleased to announce a star studded evening of performances at the Revlon Rainforest Fund Benefit Concert on Thursday, April 17th, 2014. Musicians and performers of international acclaim will take to the Perelman Stage at Carnegie Hall to raise awareness and funds for the important work the Rainforest Fund provides to communities of indigenous peoples throughout Brazil and other countries including Belize, Cameroon, Costa Rica, El Salvador, Guatemala, Guyana, Honduras, Indonesia, Madagascar, Mexico, Nicaragua, Papua New Guinea, Peru, Suriname and Venezuela. With the generous support of some of the world's most well-known musicians and performers, throughout 18 years of concerts of its kind, the evening continues to be one of the most sought-after tickets of the New York social calendar. Past performers include Elton John, James Taylor, Billy Joel, Bruce Springsteen, Tina Turner, Stevie Wonder, Paul Simon, Diana Ross, Bette Midler, Meryl Streep, Bruno Mars, Lady Gaga, Will Ferrell, Jennifer Hudson, and many, many more. 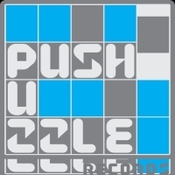 Talent for this year's concert will be announced at a later date. 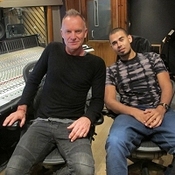 The biennial Rainforest Fund concert provides a major source of funding for the work of the Fund, which was started by Sting and Trudie in 1989, out of a desire to help a community of indigenous Amazonian people in Brazil. Since this humble start, the work of the Fund has expanded to include 23 countries on three continents. Partnering with more than 100 local organizations, The Fund seeks to conserve the environment as well as support hundreds of thousands of indigenous people in their fight to protect their rights to their own land, livelihoods and cultures. Box office tickets for the Silver anniversary celebration of the Rainforest Fund will go on sale at Carnegie Hall beginning Monday, March 3rd at 11:00 AM. To purchase tickets, please visit www.carnegiehall.org or call CarnegieCharge at 212-247-7800. To purchase benefit tickets and packages, please email rainforest@eventassociatesinc.com or call 212-245-6570.